3600PA Printer Applicator is rugged & versatile, high speed, thermal transfer labeler used to print and apply pressure sensitive labels to various products. A Sato or Zebra print engine is integrated into an applicator to form a self-contained unit to print variable data. It is assembled with right or left hand printer modules & is mounted in various positions to apply labels to the top, sides, or bottoms of a multitude of products with its proven tamp-blow application. 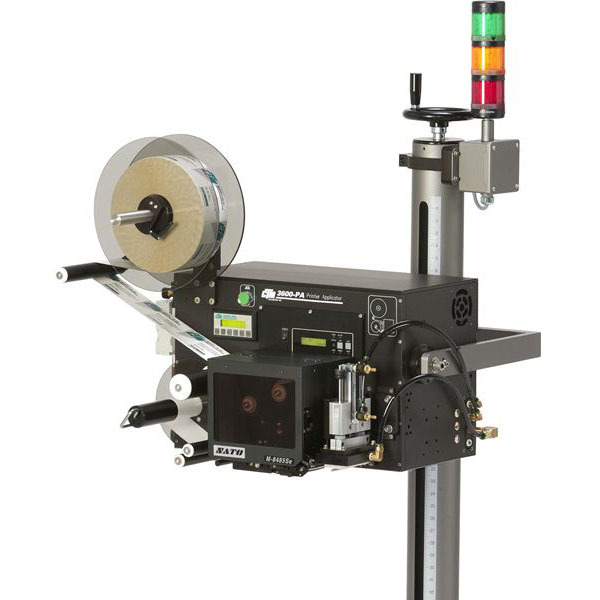 3600-PA Dual Action Tamp (DAT) Printer Applicator is a high speed, thermal transfer Labeler used to print and apply pressure sensitive labels that can be programmed for single or two panel labeling application applied to various cartons, cases or pallets. The single panel can be applied to either the front or the side. Sato or Zebra print engine integrated into the applicator to print variable data. It can be mounted in almost any position to apply labels to the leading, side or trailing panels of various products.